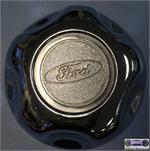 3184-2, CENTER CAP USED, 95-96, FORD, RANGER. CHROME WITH FORD LOGO ROUGH CENTER, 5 CLIP ON LUG NUTS. 5 INDENT IN CENTER CAP. 6-1/4" DIA.